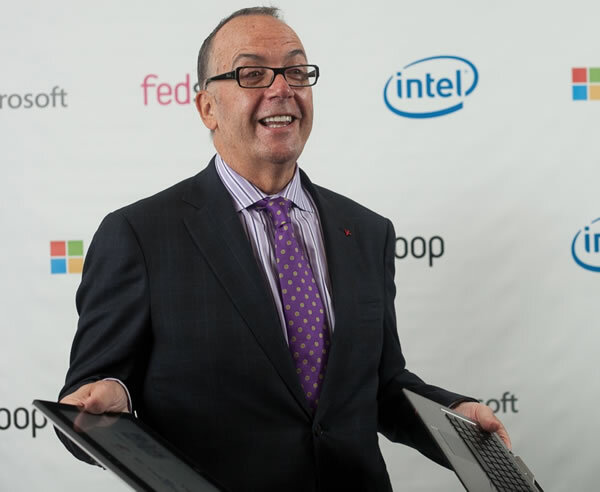 Nigel Ballard, director of federal marketing at Intel, recently sat down with FedScoop for a Q&A to share his expertise on the ever-changing mobile environment within the federal government. What’s the latest when it comes to the client space? A lot has happened in the client space since we last talked. And if the term ‘client’ is too nerdy to readily grasp, I’m talking about the device you and your fellow team members enter and extract data from. It comes in assorted shapes and sizes and probably has a keyboard! Think of the server in the data center as one end of your computing chain, and the client at the other end. Two years ago we had the Telework Act in place and federal agencies were embracing mobility, refreshing cumbersome and static desktop PC’s with highly portable client devices, namely laptops. I’m pleased to say that many agencies tackled the security side of allowing personnel to access secure systems remotely head on by embracing the Intel vPro platform available from experienced government manufacturers such as HP, Dell and Lenovo. Everyone seems to have a laptop – isn’t that good enough? I think treading water is rarely the chosen option when it comes to technology! Tablets emerged and folks really took to them, especially those who consume as oppose to create data. What do I mean by that? If you type a lot of text, are verbose, manipulate images or process data, or ‘gasp,’ have a need to multitask, then the tablet wasn’t for you. If, however, you view a lot of data and have mastered the art of the somewhat curt email reply, then the tablet probably suited some 80 percent of your computing needs admirably. What about the remaining 20 percent? All those email replies and Excel spreadsheets you need to manipulate, and all those images you need to catalogue, that’s where you laptop shone and continues to shine. But one size doesn’t fit all. Ask anyone who works in a shoe store, and they’ll confirm we’re as unique as snowflakes. What other client computing models are you seeing out there in the government space? BYOD or “Bring Your Own Device.” The notion of allowing employees to bring their own devices into the workplace became a popular notion though apparently not a widespread practice. A lot of discussion and tire kicking took place and continues to take place. One business model has employees being given a stipend to assist them in buying the device. Another model provides a minimum specification though I’m not sure if they require the client to support vPro, which I think would be something of a miss. A third model, I’m told, provides a specific list of approved devices. I can be a little slow on the uptake, it must be admitted, but really, from a holistic perspective I just don’t get BYOD. Its driven by the need to save costs, right? I therefore remain unconvinced that a potential dollar saving is worth the risk, despite what some large bodies claim. Feel free to convince me otherwise as, like a good politician, I can change my opinion based upon fresh data. Where do you think the risk lies? If I was involved in IT support or, heaven forbid, IT security, I think my nights would be sleepless thinking about that stream of employees wanting me to support, enable and connect a slew of products I’d never previously encountered, wasn’t sure were TAA compliant and couldn’t be sure if said devices were festooned with backdoors. I wouldn’t want to be the recipient of the collective and probably highly publicized finger-pointing as it unfurls that all manner of miscreants have gained access to my once secure computing environment. Then there’s the governance side of BYOD. So an employee downloads something dubious or ill-advised onto his or her device – It’s ‘their’ device because they laid out the money right? Wrong. And it was out of work hours, and on their own home network, and it may be even stored in a different hard-drive partition. So is it the agency’s concern or a police matter? Does your agency promptly get dragged into something that would otherwise be a straight criminal matter involving a private citizen? Is it going to raise the unions’ hackles that you even became involved? At the end of the day, how much legal and technical control can you ultimately have on a device that you didn’t outright purchase and provided to an employee as a managed asset? What’s the word I’m looking for here? Minefield! So where did Intel take the client computer? Take the laptop as you know it, make it lighter, thinner and better equipped than the laptop you’ve become accustomed to – that’s Ultrabook. Then re-imagine that sleek new form factor with models where the screen swivels, flips over and on some models the screen even disconnects turning it into a … wait for it … a tablet! Yes, a number of the latest Ultrabooks are touch enabled, tailor made for Windows 8, which is such a perfect enterprise OS for touch-enabled PC’s. Name a PC manufacturer, and they probably have a number of Ultrabook models to suit every need. Touch it, flip it, swivel it, detach it and, yes, secure it. Business Ultrabooks come with the vPro option. I would be remiss of me if I didn’t give a shout out to Windows 8 which really rather rocks it on the Ultrabooks and the Intel Core-based tablets I’ve been using lately. Why do Intel-powered devices run Windows 8 in the enterprise? That’s easy. Your existing Windows apps just run, no custom app development, no closed computing environment. Your existing Microsoft network management solutions enable you to update and secure your Win8 Ultrabooks and Win8 tablets in the exact same way you manage your existing clients. What a boon to security and productivity! What’s the takeaway message you’d give a govie reading this then? Things in IT are always changing as technologies shrink and processes get honed for even greater efficiency. At the client end, the hardware is definitely getting smaller, lighter, yet more capable. I guarantee there are enterprise solutions to suit your mission needs available now or are very soon to ship. Even a slick enterprise tablet with a removable battery and an optional CAC reader this way comes! PC clients are looking Ultracool as we head into 2013!